The Aquarius man is by nature clever and likes the company of people. You are always in search of independence. Your popularity is great as you give importance to other people and in turn you earn their respect. In matters of getting into relationships you are circumspect and will take your own time to get into an alliance. Once you get into a relationship, you remain committed to it. You are faithful to your married partner. The Aquarius father traits show that as a father, when you are gifted with a child, your devotion and commitment to your soul mate and child increases immensely. In matters of relationships, you look for a complete woman who will take care of all the problems of married life and who will be able to counsel you in times of difficulty. An Aquarius father personality is highly compatible with a Leo daughter. She is attracted by his magnetism and open mind. On the other hand, a Leo daughter will charm her father by her strength of character and memory. The Aquarius father personality traits show he is always joyful, sensible and natural in his attitude towards life. You are fascinated by the ideas and ambitions of other people and at the same time you are concerned about their anxieties and problems. You may be genuinely interested in helping other people in times of hardships. The Aquarius father characteristics show you will be excited about becoming a parent and organize yourself well for the coming event. You will find the company of a child enjoyable and like to spend your quality time with the offspring. A smart and mischievous child will attract you. The child of an Aquarius parent is impressed by the broadminded father and his liberal attitude. 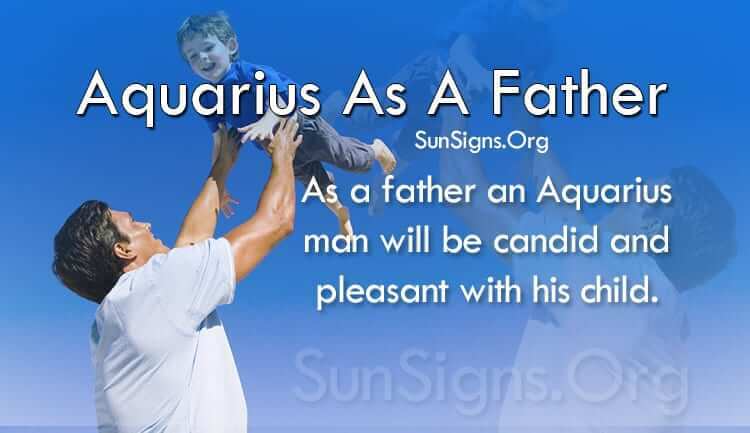 As a dad, an Aquarius male will be candid and pleasant with his child. You will make the child feel independent and there will be harmony in your relationship with your child. Too much freedom given to the child may be taken advantage of by the child and you should be wary of that. Your house may become a weird place which is full of the various educational and sports objects of your child. The Aquarius father traits show you are unconventional and will allow your child to be eccentric with strange fashion styles and grooming. You want the child to be distinct and be free to express himself freely. Your social life is filled with a wide variety of people and you want your child to be free to mingle with all sorts of people. The Aquarius father characteristics show that your child will be persuaded to use his intellectual capabilities extensively and formulate new and innovative ideas. You will lead him by example by making great plans for the days ahead instead of being trapped in the past. The Aquarius dad will have a problem in dealing with their child on the emotional plane. By nature you are more logical and fail to express your feelings openly. The Aquarius father personality traits show you should be more affectionate and encouraging to the child when he gets in to a depression. He needs you more in those times rather than when he is comfortable.